Remember that memorable scene in Crocodile Dundee where Mick astonishes everyone by holding his hat up to the sun and telling them the exact time? So too our Expedition Leaders continue to amaze everyone by being able to tell what the weather is going to do by looking at the clouds. Want to learn what they know? Then here’s the low down on clouds and 5 basic cloud formations to help you on the way. Where they are and what their shape means is more important then their names for now. 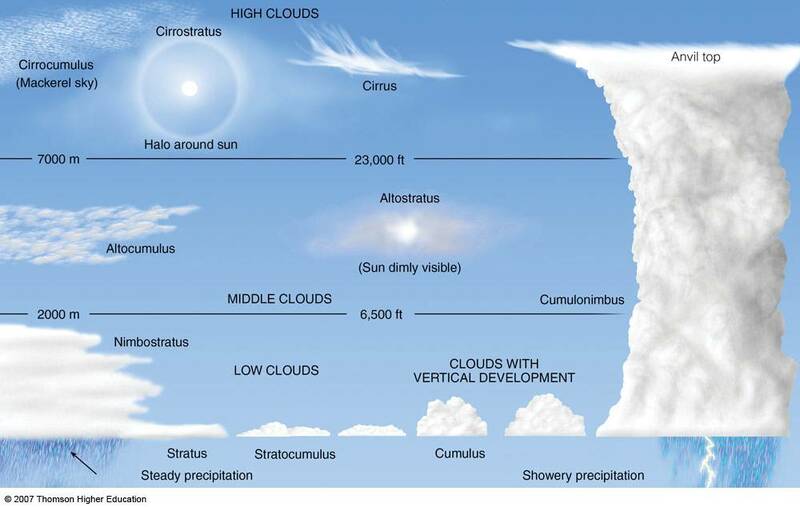 Clouds can be high, middle or low. Your altitude at the time determines what clouds you are seeing. High clouds form from 4,500 metres to above the height of Everest and relevant to us when climbing at these heights. Rather then being made of water they are made up from ice-crystals. High clouds do not block out sunlight. By watching the speed of their formation, shape and direction of movement you can tell what changes in the weather are likely to occur. Some high clouds spell bad weather but usually not for 24 hours. Middle clouds found from 2,000 metres to 7,000 metres are mostly comprised of water and often block sunlight. They usually predict a change in weather or that rain is on the way. Low clouds form below 2,000 metres and often hang around the hilltops. They contain water and if cold enough snow. These clouds mean that a change in weather is imminent and that the wind can build up. Furthermore, clouds are identified by shape. Cumulus refers to a “heap” of clouds. Stratus refers to clouds that are long and streaky. Cirrus refers to wispy or hair-like and Nimbus refers to rain. Cirrus clouds are the most abundant of all high clouds. These wispy clouds are composed of ice and consist of long, thin streamers sometimes called mare’s tails. A few scattered cirrus clouds are a good sign of fair weather. If the cirrus clouds are growing in number and almost cover the sky, expect rain within 24 hours. Cirrostratus forms a halo around the sun. If a Cirrus filled sky darkens and turns to Cirrostratus it is a sign of rain or snow, depending on temperature. Cumulus Clouds are easily recognizable, large, white, fluffy clouds. They indicate fair weather when they are widely separated, but if they are large and many-headed, they are capable of bringing heavy showers within a few hours. Altocumulus clouds are mid-level clouds that look like a layer of white and grey puffy cotton across the sky. The presence of these clouds on warm, humid mornings may mean afternoon rain is on its way. Stratus clouds are clouds, which look like a layer of grey blanketing the sky, are generally associated with wet conditions. 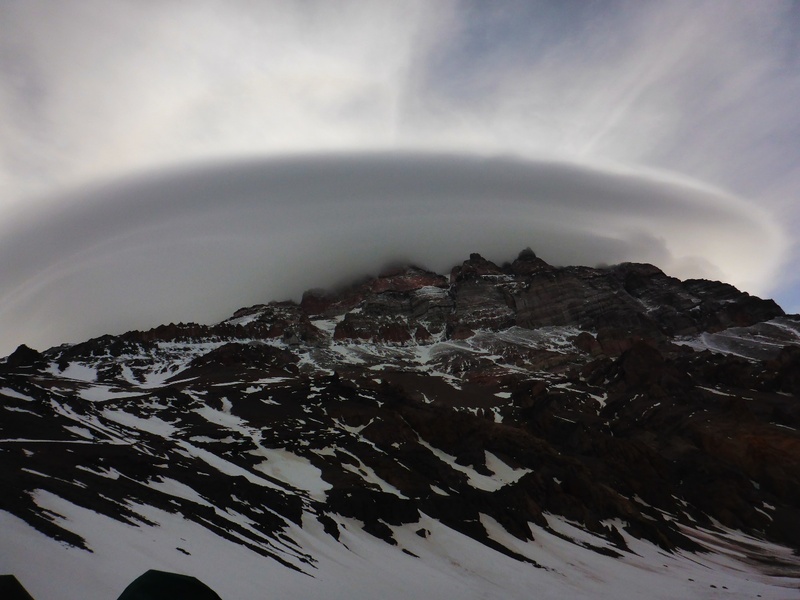 They typically form when warm air is lifted over cold air, which allows the water vapor to condense forming the grey mess that keeps us in our tents. Stratus clouds can last for days and bring cool temperatures, persistent rain, drizzle, or depending on the temperature snow. Lenticular clouds are one of the more unusual cloud types This cloud resembles a UFO and occasionally forms over a high hill or mountain. As the wind blows against the mountains, it is forced upward and moisture condenses, forming a cloud that stays stationary until the uplift or moisture feed ends. They can mean a low-pressure system is on its way bringing bad weather.